LOS ANGELES (AP) — Lou Williams said it best after becoming the NBA's career leader in points off the bench. "Any time you can say of all time next to your name, it's special," he said. 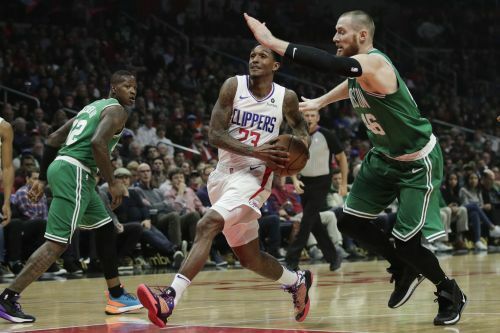 The 13-year guard scored 34 points to pass Dell Curry as the Los Angeles Clippers routed the Boston Celtics 140-115 on Monday night for their fifth straight win. Williams came into the game needing 28 points to pass Curry, who had 11,147 bench points. He surpassed Curry with 9:53 remaining in the fourth quarter with a driving layup. According to the Elias Sports Bureau, starters and reserves were tracked in box scores beginning with the 1970-71 season. "Being a sixth man and a career bench player, to have an opportunity to have something like that is special," Williams said. "I've just continued to play aggressive. The shots have really been falling the last couple games." It is also Williams' eighth game this season and 29th in his career with 30 or more points off the bench. "It's amazing just watching him play. Even tonight, just his pace and his speed," Clippers coach Doc Rivers said. "The way Lou does it with his size and how often he gets in the paint and finishes over big men is amazing." Williams, who was 14 of 20 from the field, wasn't the only Clipper who was hot from the field. Los Angeles shot 61.6 percent (53 of 86), which was its third-best game by field goal percentage since 2000, according to SportRadar. It also tied for the Clippers' second-most points scored since 2000, with only a 142-94 win over the Lakers on March 6, 2014, surpassing it. Danilo Gallinari added 25 points and Montrezl Harrell 20 for the Clippers, who led most of the game and were up by as many as 30 in the fourth quarter. "We played terrific. We shot the ball well, moved the ball and played at an amazing pace," Rivers said. "I thought the defense early on was terrific and that got us out running. We really believed that we had to turn this into a pace game to win and I thought we did that." Terry Rozier led the Celtics with 26 points while Jaylen Brown added 22 and Kyrie Irving 18. Boston had a three-game winning streak snapped as it was trying to become the second Eastern Conference team this season to win all four games in California. It is the most points the Celtics have allowed in Brad Stevens' six seasons as coach and only the fourth time since 1990 they have allowed 140 or more in a regular-season game. "It was a combination of our defense abandoning us and them playing terrific," Stevens said. "We couldn't get stops. We talked about trying to guard different ways when we should have just do better what we do. We'll move on." Gallinari scored 13 points in the first quarter to propel the Clippers to a 25-19 lead. Rozier hit a 3-pointer at the start of the second to pull the Celtics within three before the Clippers scored nine straight points to lead 34-22 with 9:55 remaining. Later in the quarter, Irving scored five points during an 8-3 run to get Boston within 46-42, but the Clippers countered with another 9-0 run to push the lead back into double digits. Los Angeles led 62-49 at halftime. A 3-pointer by Gordon Hayward with 5:04 remaining pulled Boston to 81-72 but that would be as close as the Celtics got. The Clippers led 101-85 going into the fourth quarter and steadily pulled away. Celtics: Jayson Tatum did not play due to right shoulder soreness. It is only the third time in the forward's two-year career he has missed a game, but the first due to injury. Brown started in his place. Clippers: Wilson Chandler made his Los Angeles debut at the beginning of the fourth quarter. Chandler was acquired from Philadelphia on Feb. 6 but missed nine games due to a right quad strain. Celtics: Return home to face Sacramento Thursday. Clippers: Host Portland Tuesday. The Trail Blazers lead the season series 2-1.